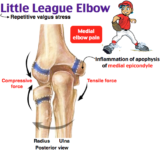 Little league elbow is a pretty common occurrence that hopefully most throwers can avoid. I see these injuries typically in either overpitched athletes, or in larger, stronger athletes that are still chronologically young, though biologically they are overdeveloped. Stronger pitchers tend to be overused by coaches, bringing about what doctors now refer to as “Little League Elbow”. In short, Medial Epicondilytis or “Llittle League” elbow is an irritation in the cartilage tissue that connects the muscles in the forearm and fingers, to the upper arm. From 11 years old to approximately 16 years old, bone that will eventually grow and fuse the growth plates together will form a strong bond. Until this time, throwers are subject to tiny microtearing in the cartilage. The tearing can range from mild swelling to major irritation (Little League elbow), to full on cartilage separation, to fracturing the newly formed bone before it has a change to heal. Xrays can diagnose both the injury and the formation of the plates. I recommend that throwers that play year round baseball get checked yearly around their birthday to keep updated on their body’s growth. The only “cure” for medial epicondilytis is time for the tissues to heal before throwers can commence taxing the arm again by throwing. Since the injury isn’t muscular in nature, rest, not rehab is best suited for the injury. Depending on the severity of the injury, growth plate separations can take anywhere from 3-4 weeks to 3-4 months to properly heal again to throw with strength. Once the injury is healed and checked by a qualified orthopedic doctor, non-specific and specific weight training for the joint should be programmed into his workouts to strengthen the muscles that work around the elbow joint. How do we strengthen the arm so this doesn’t happen again or at all? Arm injuries in baseball are rarely freak occurrences. They are brought about over time and repetitive stress. There is no pitching mechanic that will completely alleviate the stresses of the throwing motion. Only time, maturity and progressive, level-headed coaching and training can ward off the chances of severe injury. More importantly, the pitcher should have a qualified professional instructor take a look at his mechanics to make sure they are as streamlined as possible and don’t involve quirky or misdirected movements that will put pressure on the elbow joint in the future.